Ken Sazama has created a GoFundMe campaign to raise money to say good bye to the workers at Hyde Square mainstay Sorella's, which is closing for good at the end of this month. Read more. 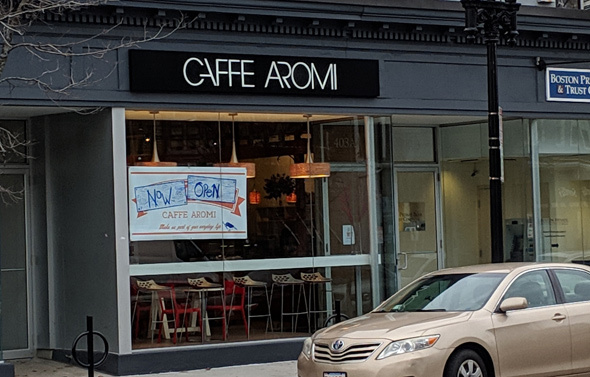 Caffe Aromi in Hyde Square, which re-opened in November after being shut for three years, has already closed, disappointed members of the Jamaica Plain Facebook group report. Read more. Around 9:30 on Creighton Street between Bynner and Centre streets. Caffe Aromi, on Centre Street in Hyde Square, re-opened this week, with the same unusual backless chairs with air holes it had when it shut in 2015. It's in the space once occupied by the June Bug Cafe, which the landlord rented the space to after essentially forcing out Bella Luna and the Milky Way Lounge and Lanes - a sad reminder of which remains on one of the handles in the doorway to the basement where the bowling alley used to be: Read more. Shooting scene. Photo by Eduardo Reyes. 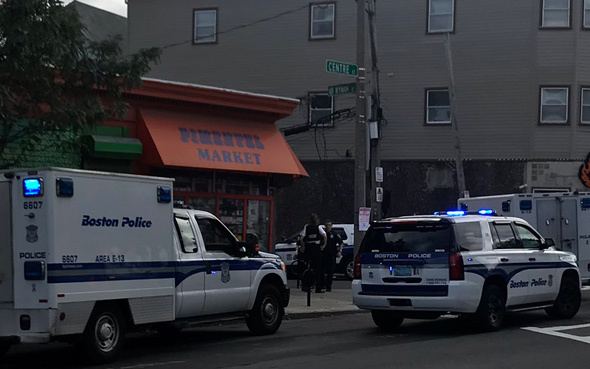 A woman and a man were shot inside the Pimentel Market on Centre Street at Wyman Street around 2:45 p.m. Read more. Ethiopian Cafe, 377 Centre St. in Hyde Square, is seeking a license that would let diners bring in their own wine and beer. Read more. Gretchen Van Ness captured the scene at the Jamaica Plain Whole Foods this afternoon, where somebody managed to push down a fence in the parking lot and then a tree planted on Centre Street. 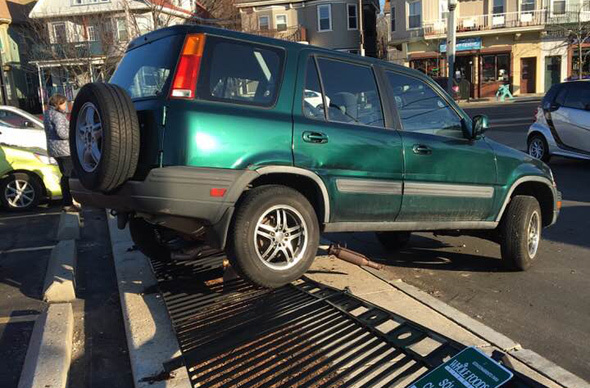 No injuries, although a woman who had been on the sidewalk just a few feet away was shaken up. The Jamaica Plain Gazette reports the city will be re-doing the streets around the little rotary, which itself will be rebuilt. The Globe reports three high-school students from Jamaica Plain have discovered that the owners of the Boston Garden were legally supposed to be holding three charity events a year to help fund the city's recreational facilities as a condition of its construction, - only they somehow forgot and haven't held a single one. Maybe next the kids, spurred by JP resident Michael Reiskind's memory, can look for the fabled lost document requiring a public observation deck at the top of the Hancock Building - and James Michael Curley's desk. Boston Restaurant Talk reports an Ethiopian cafe is planned for the Centre Street space vacated by Aurum, and that the people behind the nearby Blue Nile might be involved. 12 Creighton St. fire. Photo by J.S. Hummel. 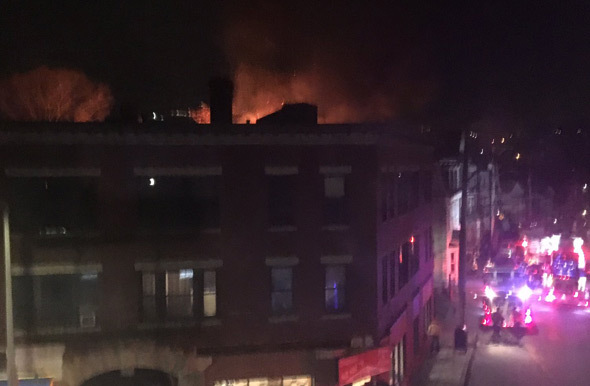 Boston firefighters responded around 5 p.m. for what became a three-alarm fire at 12 Creighton St. that destroyed the building's rear porches. Read more. Oh my god dumpster dive alert all the coolers at WF Jamaica plain failed and they have to throw it all away. Eggs everything. Seriously, what's a Scottish restaurant without whisky? Haven owner Jason Waddleton after handing some paperwork to board. UPDATE: The board approved the license request. The Boston Licensing Board could decide tomorrow whether to let Boston's only Scottish restaurant add whisky to the Scottish beers it now offers. 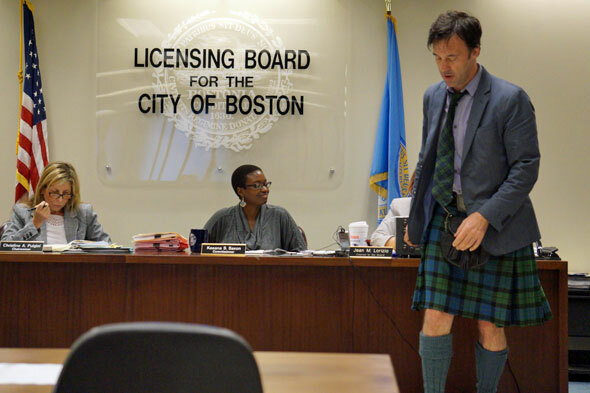 Jason Waddleton, owner of the Haven, 2 Perkins St. in Jamaica Plain's Hyde Square, told the board today people constantly ask him why they can't get some whisky to go with their haggis, Scottish eggs, smoked salmon and other Scottish delicacies. Read more. Mayor Walsh today annnounced a ten-year program, called Boston Creates, to "weave arts and culture into the fabric of everyday life" in the city. The city will set aside money each year for public art projects - 1% of each year's spending on capital projects. One of the first areas to benefit will be Hyde Square in Jamaica Plain, where the city Public Works Department will spend $100,000 on public art to go along with a planned road upgrade. Read more. Around 5:10 p.m. on Centre Street at Mozart in Jamaica Plain. The baby girl just wasn't waiting for the ambulance to arrive; she appeared moments before the EMTs, with the help of Sgt. Rene Sanchez. Boston Police report: Read more. The City Council voted unanimously today to approve a measure celebrating the Latino heritage of Centre Street from Hyde to Jackson squares in JP. The designation of the stretch of Centre Street does not change the name of either square, but could make the area eligible for state funds, City Councilor Matt O'Malley (Jamaica Plain, West Roxbury), who sponsored the proposal, said. The Baltimore Sun reports investigators are following clues and a tip that a body still unidentified nearly 40 years after it was discovered near a Maryland cemetery was that of a young woman who may have lived in Hyde Square. Read more. The City Council today agreed with a proposal to look at designating Hyde and Jackson Squares as an official Latin Quarter, in recognition of the Latinos who have long called the area home. Read more. The Boston Licensing Board today approved a licensing swap in which the owners of Frogmore in Hyde Square will sell their beer and wine license to the new dumpling joint going in where Charlie Chan's used to be and Frogmore will in turn get one of the new all-alcohol licenses available in certain Boston neighborhoods. Read more.